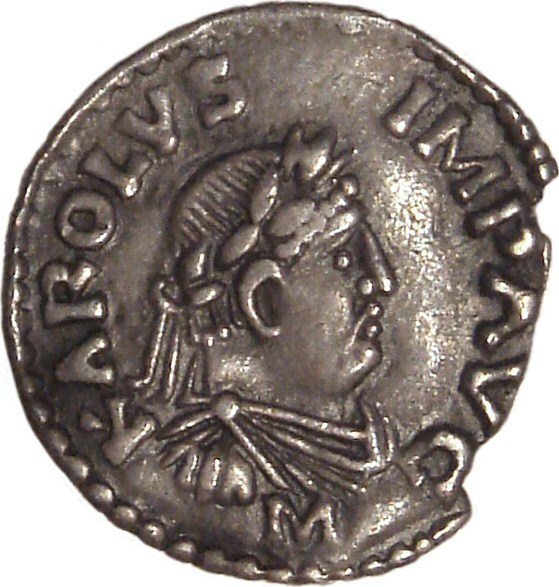 Charlemagne () or Charles the Great (German: Karl der Große, Italian: Carlo Magno/Carlomagno; 2 April 742 – 28 January 814), numbered Charles I, was King of the Franks from 768, King of the Lombards from 774, and Holy Roman Emperor from 800. He united much of western and central Europe during the Early Middle Ages. He was the first recognised emperor to rule from western Europe since the fall of the Western Roman Empire three centuries earlier. The expanded Frankish state that Charlemagne founded is called the Carolingian Empire. He was later canonized by Antipope Paschal III. Charlemagne has been called the "Father of Europe" (Pater Europae), as he united most of Western Europe for the first time since the classical era of the Roman Empire and united parts of Europe that had never been under Frankish or Roman rule. His rule spurred the Carolingian Renaissance, a period of energetic cultural and intellectual activity within the Western Church. All Holy Roman Emperors considered their kingdoms to be descendants of Charlemagne's empire, as did the French and German monarchies. However, the Eastern Orthodox Church views Charlemagne more controversially, labelling as heterodox his support of the filioque and the Pope's recognition of him as legitimate Roman Emperor rather than Irene of Athens of the Byzantine Empire. These and other machinations led to the eventual split of Rome and Constantinople in the Great Schism of 1054.